The book “The Checklist Manifesto” was a game changer in risk management as it crystallised into words the importance of a systematic approach to risk management using checklists. The aviation industry has used checklists for years. This manifesto can be applied to other industries to improve efficiency. The aim, however, is not only to minimise risk but also to improve performance. Improving performance requires the additional component of developing insight. This important concept was highlighted in Gary Klein’s book, Seeing What Others Don’t: The Remarkable Ways We Gain Insights. In short, reducing errors plus developing insights is the basis of performance improvement. Checklists can help you achieve the first part (reduce errors), which then allows you time to develop the second part (improve insights) which is necessary for creativity and progress. Without checklists, a disproportionate amount of time is spent in reducing errors in an inefficient manner which then allows little or no time to develop insights. SO WHY AREN'T CHECKLISTS COMMON PLACE IN THE REAL WORLD? One reason may be due to our excessive focus on the outcome without sufficient emphasis on the process. In taking exams, we know we want to pass the exam (outcome) but do not spend sufficient time on the question of what is the most effective way of passing the exam (the process). Read the posts on return on effort and study hacks for tips on maximising efficiency when preparing for the exam. Many people think that spending hours on textbooks is enough; I can assure you it is not. In fact, it may be quite inefficient. The process of how you assimilate knowledge is more important and thinking about this process in detail and applying it successfully will help you achieve the desired outcome. Assimilation of knowledge requires an understanding of our memory systems covered in the video below. The outcome, then, becomes a byproduct of an effective process. This concept also applies to important aspects like money management and investing. People focus on the outcome saying “I want to become rich”, but how many focus on an effective process? I bring investing up, because it was Charlie Munger (Warren Buffet’s business partner) who articulated the importance of ‘the process’ extremely well and I believe his quotes below apply to many things in life. Their company Berkshire Hathaway has comfortably outperformed the market year after year which is most likely the byproduct of a successful process. Checklist routines avoid a lot of errors. You should have all this elementary [worldly] wisdom and then you should go through a mental checklist in order to use it. There is no other procedure in the world that will work as well. You’ve got to have models in your head and you’ve got to array your experience – both vicarious and direct – on this latticework of models…. The first rule is that you’ve got to have multiple models because if you just have one or two that you’re using, the nature of human psychology is such that you’ll torture reality so that it fits your models, or at least you’ll think it does… And the models have to come from multiple disciplines because all the wisdom of the world is not to be found in one little academic department. When one thinks about checklists in psychiatry, the DSM is probably the first thing that comes to mind. The checklists used in the DSM, however, have the potential to cause more harm than good if used inappropriately, something that the DSM itself recognises. The specific diagnostic criteria included in DSM-IV are meant to serve as guidelines to be informed by clinical judgement and are not meant to be used in a cookbook fashion. Clinicians may encounter individuals whose symptoms do not meet full criteria for a mental disorder but who demonstrate a clear need for treatment or care. 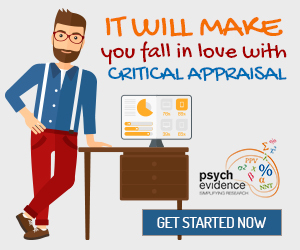 The powerful checklists in psychiatry, therefore, are ones that improve insights and take into account many bio-psycho-socio-cultural variables leading to a sophisticated formulation. Read more about psychiatric formulations in this post. 1. Diagnostic spectrums – What are the diagnostic issues with the patient? 2. Formulation models – Why is the patient presenting to us at this point in time? Checklists are valuable in clinical practice to cover the basics as it sets up a framework upon which other sophisticated tasks can be built. Is there any thing atypical about this case? The above is a crucial step as mentioned in one of my previous posts on psychiatric formulation. The ability to distinguish between zebras and horses when one hears hoofbeats relies upon a systematic process of excluding of the impossible. This is what a checklist allows you to do. 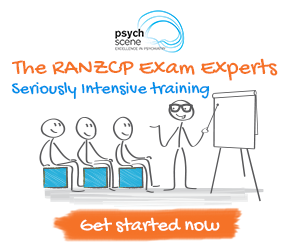 Since the RANZCP OSCE and MRCPsych CASC exams are a slice of clinical practice, checklists are indispensable. In the 1 or 2 minutes before the exam station, the candidate should ask themselves – what are the key issues in this station? Remember the checklist is not just a list of diagnostic criteria, it goes beyond that. You think about psychosocial issues, forensic issues, personality factors, etc that are relevant to the scenario. The smart thing of course is to ensure that questioning does not come across as a checklist, otherwise the patient may question if they’ve come to the right place, or the examiner may think of you as an automaton. This will require interviewing skills ranging from redirection, transitioning, facilitation, and so on, so that the questions are interwoven amongst elements of empathy and curiosity. 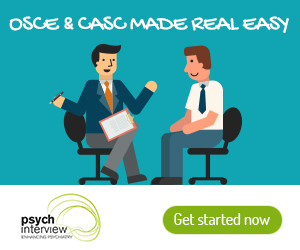 So whether you are taking the MRCPSych CASC, the RANZCP OSCE, or RCPSC OSCE exams, ensure that for each of the possible scenarios, you have a structured checklist in your mind which is your structure and strategy, which then allows you to adapt quickly to any tricky elements that you may come across.